When you watch your favorite celebrity on the big or small screen you probably don’t think about their past or problems they’ve had to overcome. These five famous moms picked up a drug habit in their teens but was able to come clean in later years. Hopefully their stories have helped, or will help, others in the process. 1. Stacy Ferguson (Fergie) – The Black Eyed Peas singer, Stacy Ferguson, AKA Fergie, started taking drugs as a teen, first ecstasy then she progressed to crystal meth. On Oprah’s Next Chapter she said, “I got into a scene. I started going out and taking ecstasy. From ecstasy it went to crystal meth. With any drugs, everything is great at the beginning, and then slowly your life starts to spiral down. [I was] 90 pounds at one point.” Soon, the singer started becoming paranoid and even thought the Feds were waiting for her outside of a church. “…so I had a conversation with God…and I said, ‘Alright, if I go out there and the FBI and the SWAT team’s not out there, then it’s the drugs and I’m stopping.’ I went outside of the church…and there was no SWAT team, there was no FBI, just me and God. And I kept my promise…” Therapy and soul-searching also helped the musician. 2. Tatum O’Neal – Oscar-winning actress, Tatum O’Neal began using drugs at fourteen and used throughout her adult years. Sadly, the star did not have a stable home life, growing up with both parents abusing drugs themselves. O’Neal even lost custody of all three of her kids to ex-husband John McEnroe in 1995. In her memoir, A Paper Life, she revealed that her father, actor Ryan O’Neal, once gave her and a friend weed to try when she was a teen. She also admitted that her young daughter once walked in on her using heroin. The actress said she’s been clean since the late 90’s after going to therapy and attending Alcoholics Anonymous. It’s been reported that she had a brief cocaine relapse in 2011, but has been clean ever since. 3. 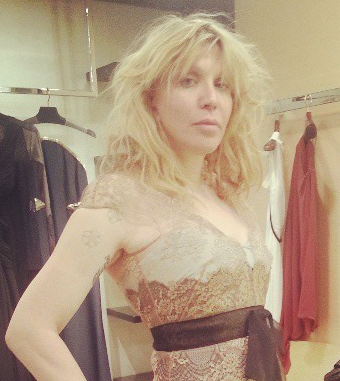 Courtney Love – Alternative rock musician, Courtney Love, has a long history with drug abuse, which began when she was a young teen when she tried marijuana. Marijuana turned to heroine when she was 16, then cocaine followed when she was 19. Love realized she had a problem when she became pregnant with her daughter, Frances Cobain, admitting that she unwittingly used heroin in the first three weeks of her pregnancy. When the singer was on the Late Show with David Letterman she said after spending time in rehab in the mid-2000s, she stopped using. She also said Buddhism has helped her. 4. Nicole Richie – Nicole Richie talked to Diane Sawyer about her drug use when she was young. The reality star said that boredom led to her drug habit. “I got so much so fast that nothing really excited me anymore,” the daughter of Grammy-winning musician Lionel Richie admitted. “At 18 I had just been doing a lot of cocaine,” she continued. When she reached her early 20’s Richie had to deal with a heroin addiction, “I, again, made the decision for myself, this is something I have to do. I have to get off drugs. This isn’t the life… ” Richie sought treatment and said she hasn’t touched cocaine since she was 18 and heroin since she was 21. 5. Drew Barrymore – It’s hard to believe that the talented, bubbly mom, Drew Barrymore was once addicted to drugs and alcohol, but it’s a sad reality. In her autobiography Little Girl Lost, published when she was only 14, Barrymore wrote, “I had my first drink at age nine, began smoking marijuana at ten and at twelve took up cocaine.” The actress entered rehab when she was just 13-years-old. After a suicide attempt at 14, her mother sent her back for treatment and afterwards she spent three months with musician David Crosby and his wife Jan Dance, both substance-abuse survivors. Crosby told PEOPLE, “She needed to be around some people that were committed to sobriety.” Barrymore has been sober ever since. You always share quite the Hollywood knowledge! I definitely don’t know much about it. Drew Barrymore, shocking! What a list. I had forgotten a couple of them. The most shocking for me is Drew who was an avid drug user and party girl at the age of 10. So hard to believe. I just adore her! What a beauty! It’s amazing that they all got through it. Not an easy task. Thanks for this inspirational and positive testimony of women who are celebrities but candidly expressed their past and are able to move on and create wonderful lives for themselves! Yes your insights are Hollywood are always great!! I knew about Courtney Love, but not the rest…I love Drew Barrymore, was shocked too on that one! Have a great week in the So Cal sun, I so love it there! We have a big cool down in the NW, it has been scorching! Love me some celebrity gossip! Thanks for sharing!!! !